Deacon Jesse served with the 583rd Air Force Band of France for four years. Upon returning home he met his wife Agnes and married in 1963. They have four children and five grandchildren. He studied four years for the Diaconate and was ordained at Cathedral of Saints Peter and Paul in Providence RI on June 5, 1982. His first ministry was with the sight impaired, then the Veteran's home in Bristol. 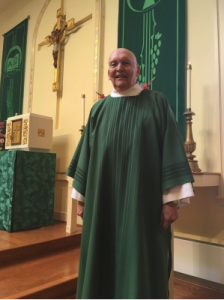 Deacon Jesse was then granted parish ministry at Saint Theresa in Tiverton, RI where he served until 2012 - a total of 27 years when he retired from full time ministry. After carefully considering their next parish family, Deaon Jesse and Agnes joined St Bernard parish in 2016. Although his health determines his involvement, he is happiest when serving.